January can be a cruel month for gasoline retailers. It inevitably brings the lowest demand of the year but often higher wholesale costs as money pours into futures and spot prices. January 2019 proved to be the exception to this rule. Wholesale gas prices in most locations bottomed out during Christmas week, but a slow and uneven climb in the first month couldn’t take the luster off yet another lucrative retail fuel market. Whereas January 2018 was a bit of a slog, with rack-to-retail margins hanging between 15-20cts/gal, January 2019 weathered a mid-month slump that took margins just briefly below 20cts/gal before rebounding to top 30cts/gal as the polar vortex took aim on more than a dozen states. Incredibly, January 2019 represented the most profitable first month since OPIS started tracking wholesale and retail costs. Click here to Tweet this. Some perspective is warranted. 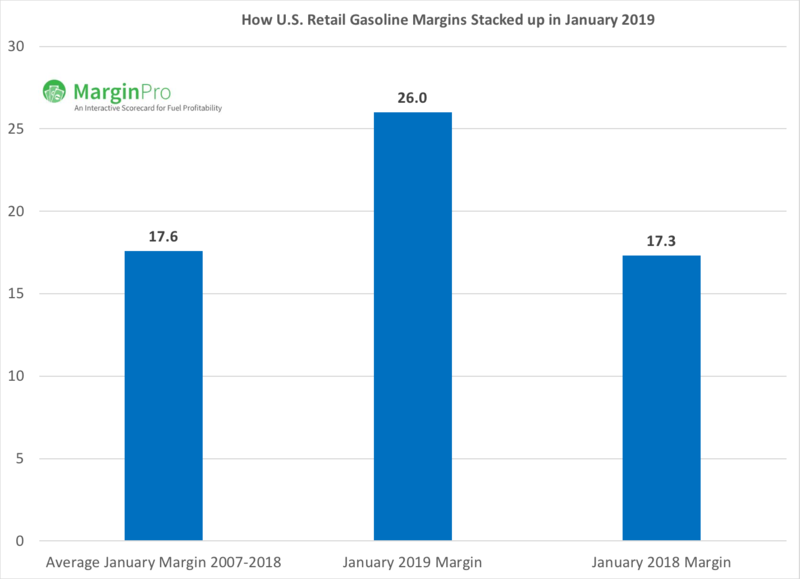 From 2007 through 2018, the average gross margin (separating wholesale costs and pump prices) was 17.6cts/gal, making January the fourth least profitable month based on that 12-year history. But January 2019 brought an average gasoline margin of 20.6cts/gal, reflecting a 50% improvement from the January 2018 performance. There are only a few North American companies that disclose retail performance when they deliver fourth-quarter earnings, but for those that do, retail may indeed be one of the shining segments in the business. Guidance for the first quarter of 2019 should also be stellar, given the record start. Recent numbers do nothing but reinforce the wisdom behind the high multiples that consolidators, private equity and various joint ventures have paid for retail properties in the last two years. A deeper dive into wholesale and retail numbers reveals that western states represent the “El Dorado” of golden profits. 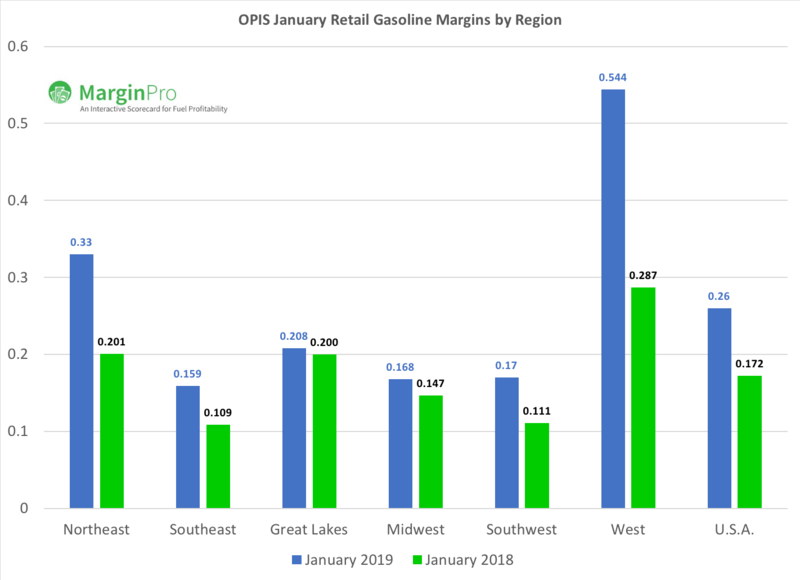 OPIS shows rack-to-retail margins out west averaged an eye-popping 54.4cts/gal in January, up from a then-robust 28.7cts/gal in 2018. The message is clear: if you can afford the real estate and the higher operational costs, western states represent the highest returns. 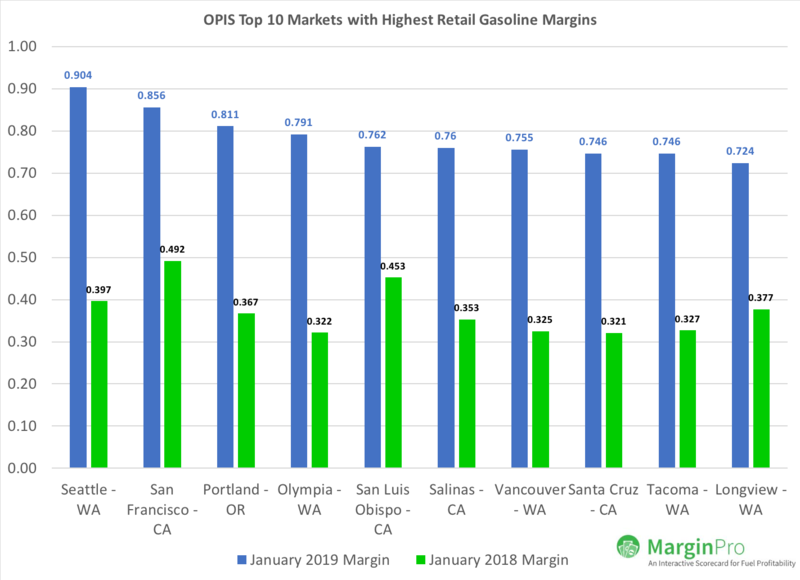 Half of the top 10 best MSAs (Metropolitan Statistical Areas) for fuel margins were in Washington, with Seattle delivering a monstrous 90cts/gal. Note to Amazon: If the company is serious about getting into the fuel distribution and retail business, it need look no further than its corporate backyard for fertile ground. Northeastern profits weren’t exactly chopped liver. That region delivered a solid 28.7cts/gal gross margin in January 2019, perhaps because the area has the lowest concentration of big box warehouse clubs with cheap gas. Southeastern states, meanwhile, offer the most daunting challenge with rack-to-retail gross margins of 15.9cts/gal in January. That still represents a midwinter performance substantially above average in the last dozen years. Where are the most hostile areas for making money in gasoline retail? Texas may have some of the most solid economic growth thanks to the shale boom, but big counties can offer big disappointment for marketers. Five of the top 10 worst places to retail gasoline are in the Lone Star state, and Lubbock was the worst place to market fuel, with gross margins averaging 4cts/gal below cost. February could offer a test of whether a secular change in retail profitability is in progress, or alternatively, whether markets are just in a temporarily prosperous groove. History shows that February traditionally offers the most challenging environment for U.S. gasoline retailers. OPIS data show that the second month has historically ranked as the month most likely to challenge margins, somewhat regardless of region. The 12-year national average for gross retail margins is 14.6cts/gal, and many individual MSAs bare red ink from Groundhog Day through Feb. 28. 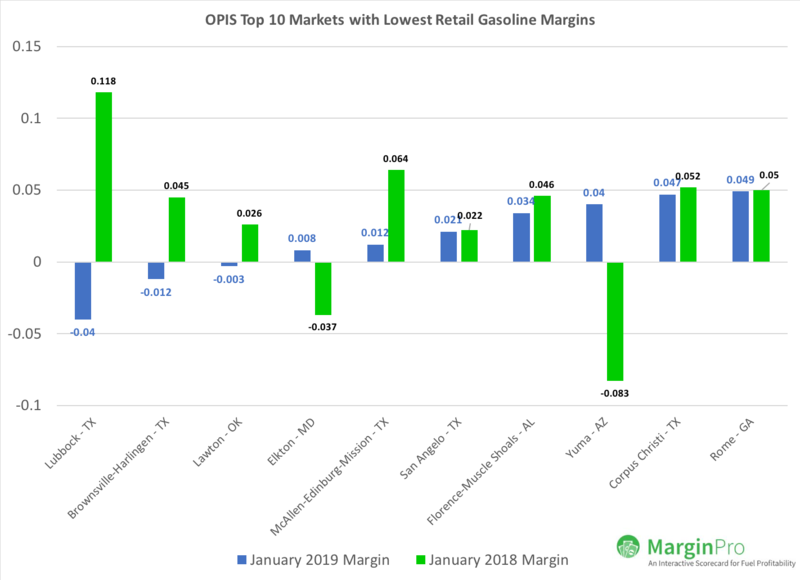 Curious about gasoline margins in YOUR local market? You can make the same comparisons Tom made in this blog, so you can become more profitable selling retail gasoline. OPIS MarginPro lets you grade your retail station's profit performance against key competitors.